Get Connected -- It's Connected Educator Month! For as many people as a teacher comes into contact with during the day, anybody who has been in the classroom knows that teachers can often feel very isolated from other professionals. Much of it has to do with the physical design of our school buildings. Much to do with the logistical design of our school day. Part of it is that so much of our day is spent with and preparing for our students that little time (or energy) is left to connect with other adults in meaningful ways. During this month, we want to raise awareness, though, that you don't have to go it alone! Make this the moment when you intentionally reach out to others to connect professionally. Ask a question. Share an experience or a practice. Offer advice, or seek it. The world is more connected today than ever, and the beauty is that those connections are more flexible and adaptable than ever before! Connect when you have time or can fit it into your schedule. There are so many of us who slip these connections in just before bed, or at a late hour when we are up thinking about "educator issues" that just won't let us drift off to sleep. Maybe that's a moment when you can commit to giving it a try without worry of trying to fit another thing into an already packed day. Remember the old adage, "Many hands make light work." Never have there been more connected educators willing to throw in to a fellow educator (albeit an absolute stranger) for the good of the cause. For those of us who have reached out and started connecting, it's amazing how rejuvenated, supported, and, well, connected you feel to others in your profession, and also, beyond your school walls. The perspective gained can be empowering and enlightening! There are SO MANY great places to start, but being Connected Educator month, one resource I'd love to point out the Connected Educator website. From book clubs to events to discussion groups, you'll find it all here. The beauty is that you'll find others who have taken the step forward to become a more connected educator, meaning you'll find people with the same goal of reaching out and trying new things. On this site you'll also find an amazing tool -- the edConnectr. 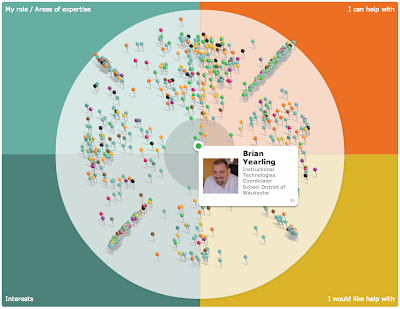 After a few minutes of inputting my personal educational interests, areas of educational expertise, and topics I'd like to connect with others on, it put forward a graph of other connected educators I may want to connect with, and as much personal contact information as the person was willing to include. Take a look at my graph at right. Each pin represents a person or group that I can connect with to start a conversation. Upon review, I knew a few of these names, but many were local people that I have not yet met. Perhaps it is time for you to create an edConnectr graph, just to see who there is to connect with. Take it one step further, and challenge yourself to reach out and connect with somebody, just to try something new and to begin connecting yourself as an educator. So go on -- give it a whirl, make a personal commitment, and see if you can get connected this month. And yes...these resources came to me from people I have connected with in my own Personal/Professional Learning Networks -- and it is THESE relationships that have made getting connected such a value added to my professional life! Thank you to all of you who I have been able to connect with over the past 8 years! It has been an absolute life changing experience for me.